My daughter Jennifer turned me on to this delicious and I do mean delicious recipe. Original recipe from Giada de Laurentis . I took a few liberties with it and it turned out just perfectly. I only used 4 thighs and 2 breasts with skin on and bone in, if you’re not comfortable with the skin I would take out skin but leave the bone in. I am certain that there is enough sauce for at least 1 more thigh and 1 more breast , there was more than enough sauce. I served over brown rice and it was just perfect. This is a beautiful meal for a dinner party or just the two of you. I used my Le Creuset pot and it was a one pot meal. Thanks to Jenn for pointing it out to me, this one is a keeper. First thing I do is dry all the chicken pieces on paper towels, this will help hold the salt and pepper and make a crackly crust. Sprinkle dried chicken pieces with Salt and Pepper generously. 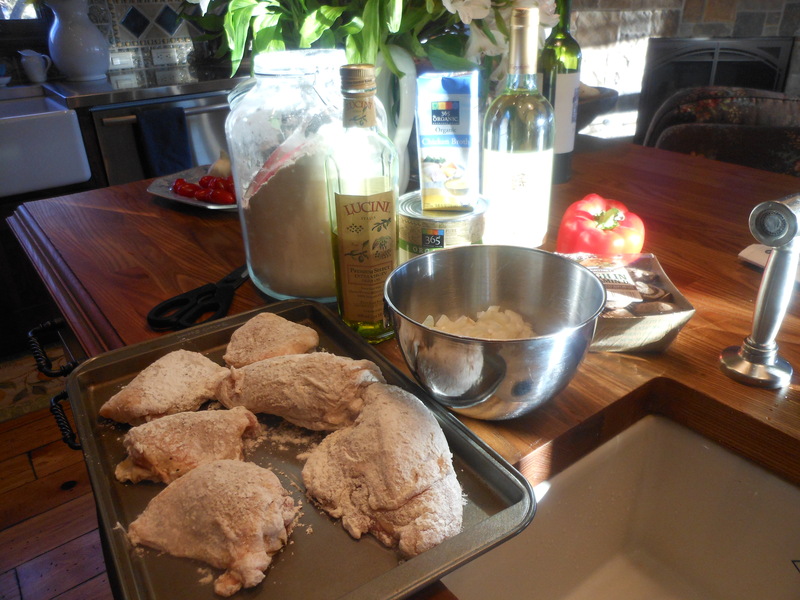 Dredge the chicken pieces in flour to coat lightly. In a large heavy pot ( I used my Le Creuset) heat the oil over a medium-high flame. Add the chicken pieces to the pot and saute till just golden brown, about 5 minutes per side. If all the chicken doesn’t fit , do it in 2 batches, I did thighs and then I did breasts. Transfer the chicken to a plate with tongs and set aside. 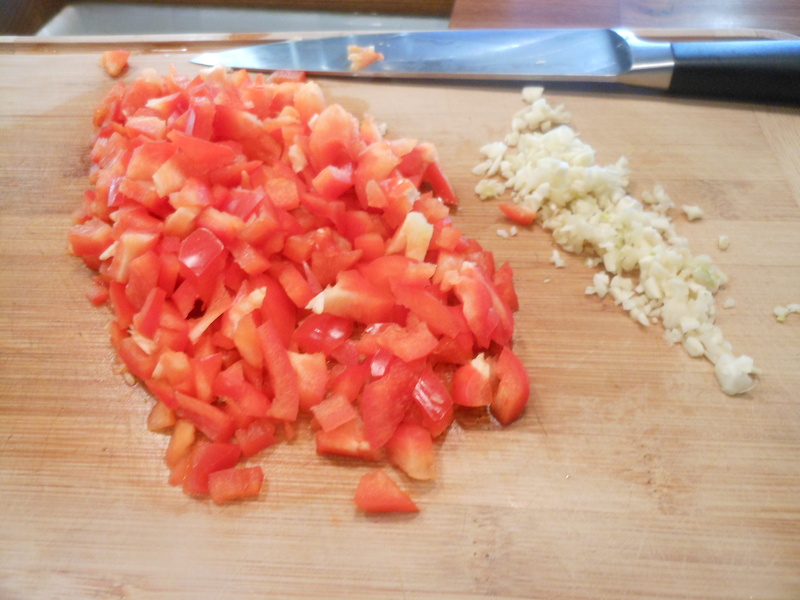 Add the bell pepper, onion and garlic to the same pan and saute over medium heat until the onion is translucent and pepper is soft, about 8 minutes. 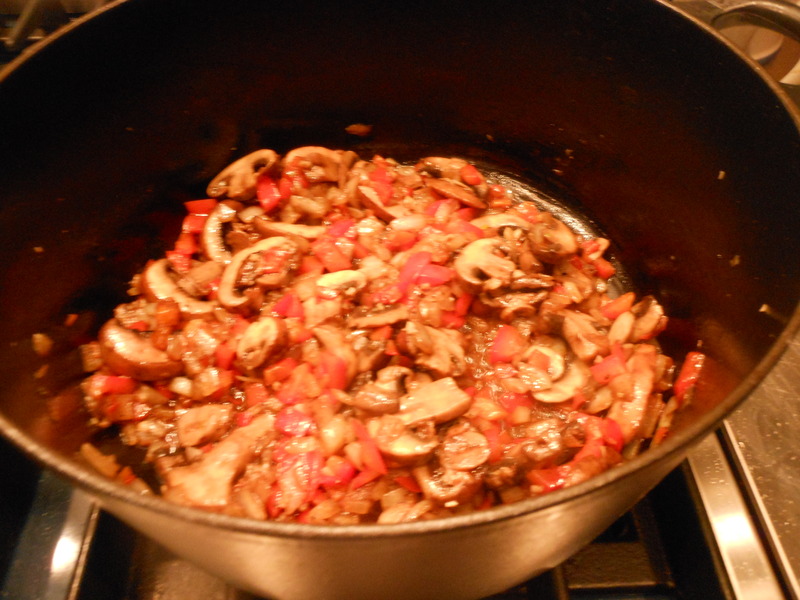 Then add in mushrooms season with salt and pepper and cook for another five minutes. 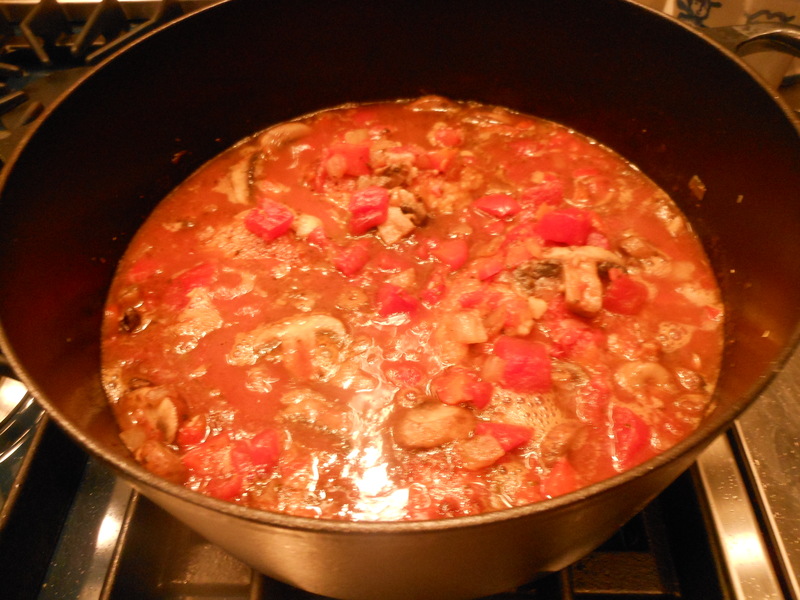 Add the wine and simmer until reduced by half, about 4 minutes. Add the tomatoes with their juice, broth, and oregano. 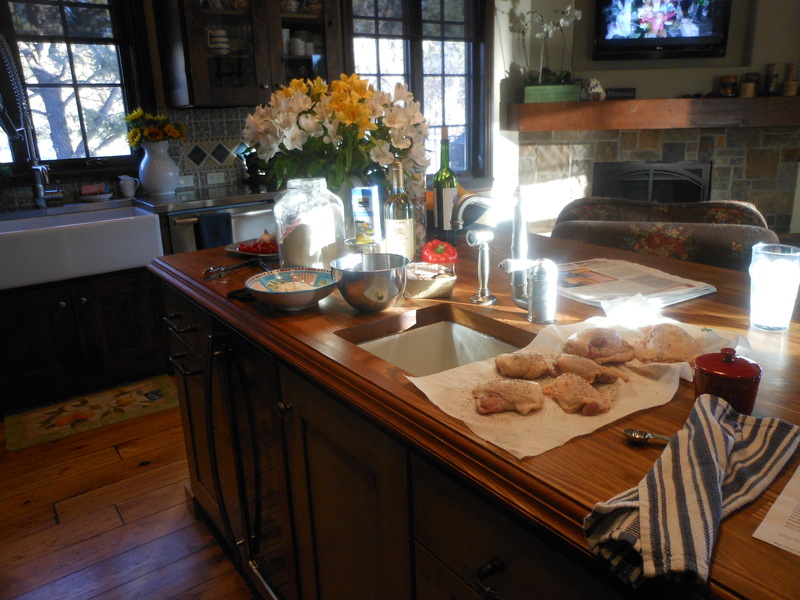 Then return the chicken to the pot and turn chicken pieces to coat in the sauce. Bring the sauce to a simmer. Continue to simmer over low-medium heat until the chicken is just cooked through, at least 30 minutes, I cooked for 40, and chicken was perfect. Using tongs, transfer the chicken to plates. If you’d like you can boil the sauce without the chicken till it thickens, my sauce was perfectly thick. Spoon the sauce over the chicken and serve. 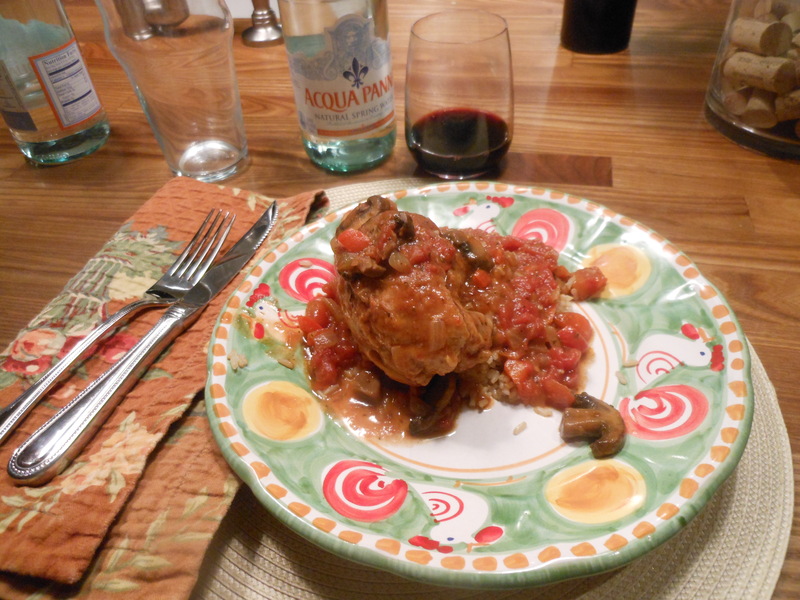 This entry was posted in chicken and tagged Chicken Cacciatore, Chicken in Le Creuset Pot. Bookmark the permalink. Omg Candi that was one of the best dinners ever! Easy to make and an easy clean up. It was perfect and we have enough for 2 more dinners. I haven’t cooked since I came across all your amazing recipes. This looks delicious! I’m excited to try it. Just curious, what colour is your Le Creuset pot? I like it because it looks dark, instead of their typical bright colours. that one is a cast iron pot! so it’s matte black , I have a blue enamel one as well.